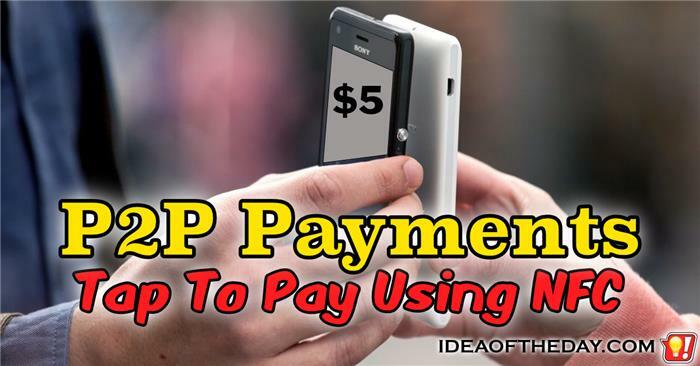 P2P Payments By Tapping Mobile Phones. NFC has revolutionized the payment industry. Why limit it to purchases in stores? There's a lot of buzz in the industry about NFC payments, which allow you to securely make payments by tapping payment terminals with your smartphone. NFC, which stands for "Near Field Communication" uses very low powered antennas that pass data only at very short distances, which means you generally need to tap your smartphone directly against another NFC compatible device to send it, which makes it perfect for swapping contact information, photos, or digital payments, such as Apple Pay, Google Wallet, etc.